As well as delight, I think it's fair to say that a large part of the emotion at the birth of a healthy child is relief. Relief that, after hearing and reading about the many dangers that lurk throughout pregnancy, the promised new member of your family is now with you in person. Like a delicate medical operation, you've survived the risky part and everything's wonderful. But just as the recovery after an operation is still hazardous, so the phase after birth continues to be a cause of worry for parents. Ask parents from an older generation and they'll tell you this phase never ends, but nevertheless children are most vulnerable in their first year of life, most notably to cot death, or Sudden Infant-Death Syndrome (SIDS). Firstly, it's important to mention that cot death is not as common as you might think based on its coverage in the media. 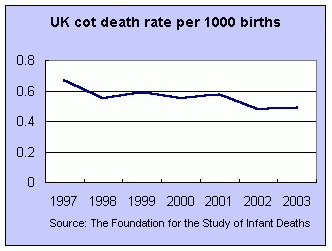 Although it is no comfort to victims, the risk of losing a baby to cot death in the first 12 months (the period of highest risk) is just under 0.05% in the UK according to the Foundation for the Study of Infant Deaths, and thanks to that organisation's work and greater public awareness, this figure is on a gradual downward trend. In addition, new research carried out by Dr. Debra Weese-Mayer at Rush University in Chicago has also suggested that there may be a genetic link meaning that a higher risk of cot death could be inherited. Again, this is no comfort to those at greater risk but this finding is being followed by more research which should lead to a greater understanding and consequently further improvement of the above statistic. This development also has big implications for cases where parents have been accused of murder following the sudden death of more than one child within a family, such as the high-profile case of Trupti Patel in 2003 who lost three of her children as babies. In that case, the consultant paediatrician involved was subsequently investigated for serious professional misconduct and other similar cases are being reviewed. N.B. Sharing your bed with your baby also introduces the risk that you might roll over in your sleep and suffocate your baby, or that your baby could get caught between the wall and the bed, or could roll out of an adult bed and be injured. See NBC TV video link regarding a mattress-wrapping promotion for cot/crib death prevention held by Jim Sprott in California this week: click on top left item (with picture of baby). This TV item has been broadcast by NBC within the past 24 hours.